Drone combines the earthy sweetness of tobacco with the warmth of vanilla, honey, and juniper berries into one rich and complex fragrance. Masculine and warm, without being too heavy or overbearing, Drone sweetly warms the home with our new favorite fragrance. Deeply complex notes of tobacco, vanilla, juniper berry, and a sweet kiss of honey combine to create the warm, rich fragrance in this candle. Inspired by Kara’s husband, who wears Tom Ford Tobacco and Vanilla. She added honey because she had to. 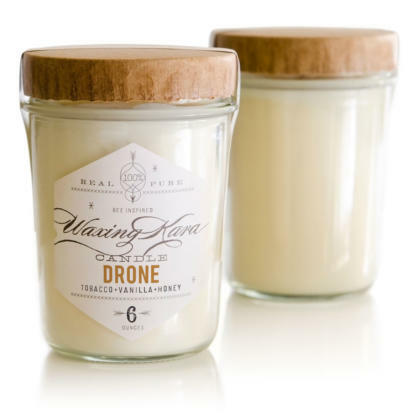 Drone gives a warm and sweet fragrance to the home. Masculine but not overpowering or heavy, Drone fills the space with brightness and cheer, especially in the cold months of the year. At Honey House, we like to burn Drone with other warm fragrances, like Tradition and Harvest. During the holiday season, these scents combine magically, and our customers always love how the store smells!